The Leeuwin Current (LC) is an eastern boundary current flowing strongly southwards along the Western Australian coastline. The current varies seasonally, with weaker southwards flow occurring during the austral summer (November to March), when southerly winds are strongest. Nearly 9.5 years of TOPEX/Poseidon-derived sea-surface heights, in conjunction with the AUSGeoid98 gravimetric geoid model, have been used to investigate the temporal characteristics of the LC over the area bounded by 20 to 45°S and 108 to 130°E. 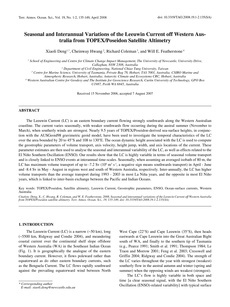 The ocean dynamic height associated with the LC is used to compute the geostrophic parameters of volume transport, axis velocity, height jump, width, and axis locations of the current. These parameter estimates are then used to analyse the seasonal and interannual variability of the LC, as well as effects related to the El Niño Southern Oscillation (ENSO). Our results show that the LC is highly variable in terms of seasonal volume transport and is closely linked to ENSO events at interannual time-scales. Seasonally, when assuming an averaged isobath of 80 m, the LC has maximum volume transport of up to -7.2 Sv (106 m3 s-1, a negative sign means southwards transport) in April - June and -8.4 Sv in May - August in regions west and south of Western Australia, respectively. Inter-annually, the LC has higher volume transports than the average transport during 1993 - 2003 in most La Niña years, and the opposite in most El Niño years, which is linked to inter-basin exchange between the Pacific and Indian Oceans.